Like similar cultural events—the Venice Biennale being the mother of them all—Prospect invites contemporary artists from all over the world to participate, exhibiting in both traditional venues—such as local museums and galleries—but also public spaces and other unexpected sites, where everyday folk might stumble across art interventions they might otherwise not engage with. Aside from its impact on cultural tourism, with tens of thousands of people travelling to the city just for the event, its larger effect has been how artists have embraced the triennial’s social mission in creating projects that connect to the city’s history, culture, people, and institutions. Prospect, in fact, prides itself on facilitating the connection between “high art” and the deeper cultural landscape of the city itself, with its rich and diverse traditions of music, Mardi Gras Indians, second line parades, and other popular cultural forms, many of which are reminiscent of our Junkanoo, Goombay, Rake’n’Scrape and so on. 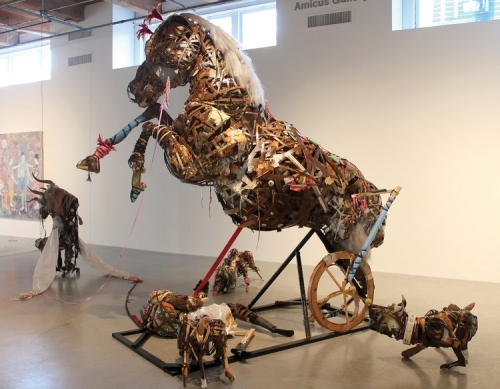 That is, while bringing in international artists from the outside, Prospect asks its audience to delve into the richness of New Orleans culture, as seen through the eyes of artists and locals, a lesson that we, as Bahamians, could learn from. Rather than cutting ourselves off from the world in an attempt to preserve our heritage, perhaps we might want to think about how outreach—whether inviting others in as well as extending ourselves outward—could be a way to heighten our own care and consideration for our institutions at home. While the first Prospect (2008) opened to a huge fanfare and saw 88,000 visitors (with 22,000 from out-of-town), the next 1.5 edition—a halfway stop while the biennial/triennial re-branded itself (2010)—saw a dip to 29,000 visitors. Prosect.2’s (2011) audience soared back up to 72,000 and Prospect.3 (2014) saw more than 100,000 local, national and international visitors. It was this edition, curated by the current Director of the Pérez Art Museum Miami (PAMM), Franklin Sirmans, which was the first to issue an invitation to a Bahamian artist, with Tavares Strachan’s stunning work in which a 27-foot high, billboard-sized hot-pink neon sign reading "You Belong Here" was mounted on a river barge that cruised the Mississippi River at night. The poetic message was appropriate for many other artists of colour of from regions considered marginal to the art world and could interpreted as an affirmation or a veiled question. A similar, more diminutive version of this work—“I Belong Here” (2012)—in yellow neon currently hangs in the entrance of New Orleans’ Ogden Museum of Southern Art and was, again, a statement by the artist as to the aptness of his presence in the institution, and as a welcome and affirmation to the diverse visitors coming into the museum. Central to this iteration of Prospect, which has placed even more of its focus southward, with a greater emphasis on art and artists who engage with the American South and the Global South, particularly those from North America, Central America, South America, the Caribbean, Africa and the European countries that colonized these regions. Schoonmaker’s Prospect.4’s artist list clearly shows how this shift has taken place—with their being almost equal representation in terms of race and gender—and out of 73 artists, almost 10% identify as being of the Caribbean, including Sonia Boyce, María Magdalena Campos-Pons, Andrea Chung, Satch Hoyt, Zak Ové, Horace Ové, Alexis Esquivel and our very own Lavar Munroe. As one of the most important contemporary art survey in the US, having a Bahamian voice—for the second edition in a row—is obviously a major achievement for our small but feisty nation and one of which we should all be incredibly proud. Furthermore, in keeping with the show’s concept of beauty flowering within inhospitable surroundings, Munroe created a work that rose to the occasion, literally as well as metaphorically, being over 12 feet high. Entitled “Of the Omens He Had As He Entered His Own Village, and Other Incidents That Embellished and Gave Colour to a Great History” (2017) his piece is a massive cardboard sculptural installation, towering over the visitors. In both cases—Strachan in 2014 and Munroe in 2017—the work made an impact that was felt literally around the world and makes our nation more and more recognizable on the international stage for more than the ubiquitous sun, sand and sea. Even something as simple as an exhibition label stating that the work on show “was made possible in part by The National Art Gallery of The Bahamas” takes our name out into the world in a meaningful and tangible way.